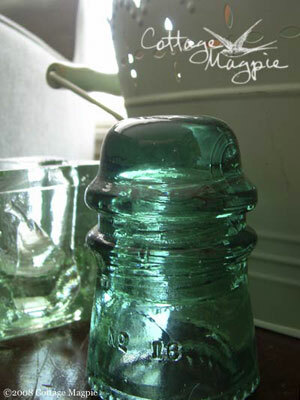 Cottage Magpie is a delightful blog that chronicles Angela’s quest to add charm to her 1950’s ranch style home. Stop by for a look at how she has created a charming home with thrift store finds and cottage style. I dropped in on Angela today to check out her round up of reader’s blog post inspired by her call for ‘Spring Green’. The entries were so creative that I decided to go back and visited each blog again and chose a favorite item to share with you. It wasn’t easy but here are my picks. At Mrs. B’s the two green vases are just fabulous together. I love the way the cool and warm greens play off each other. …at MB and Baby Makes 3 the baby in the bumbo seat is just too precious. Green and blue together is always a good combination and Courtney at Nesting Instincts likes it too but the pic of the bright green method cucumber soaps on the window sill was unexpected and so cheerful it gets top honors. At Forever and Ever House Jill blogged about decorating her green room and even offered a giveaway for some lucky advice giver so you know I enjoyed that. What beautiful collages in green at Poppins garden. I loved them all. Sorry for breaking my own rules and not picking just one. It was also tough to narrow it down to just one on Bailiwick Designs but that little green bird told me to pick him and he is so cute how could I say no? Love the green and white toile shams at Harrington House. I’d like to see a whole forest of the primitive green pine tree at Enriched. Anyone would want to take lunch in the fun bag Nancy of Thread In Hand made for her sister. The yummy treats Tara shared on Days Missed on a Hammock made my mouth water but I ordered the spinach salad. You gotta love a $3.00 TJMaxx find but check out how Jen at Sanctuary Arts at Home made it even better. Love the little wristlet bag from Kimberly at Niesz Vintage Home. I never said my favorites had to be green did I? At Fabric Paper Thread the glass fishing ball was something I hadn’t seen before. What a great find. Two hanging plates in green and white were my pick at Oak Rise Cottage. I’m with Angela of Cottage Magpie on this one. Emily’s green couch shown on Remodeling This Life is a perfect hue of blue green. The vintage wallpaper on Tuija from Ruusuja ja rikkaruohoja (Roses and Weeds) caught my eye. The fishbowl at Sew Delish is so cool I might have to get one for my office. The gorgeous close up of the green flower at Kullervilla is wonderful. Carol taught me something with her green map at Terra Nova Design. At Idaho Quilter the quilt square is my favorite but I also want to give a nod to the picture of the spools of thread in the header, which are green in a different way. Many thanks to Angela from Cottage Magpie for rounding up so much great green! Let me know which items you liked best. 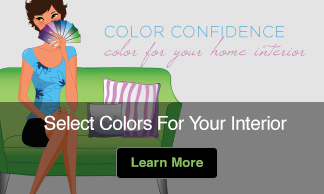 For even more great green see Julie’s Spring color craving: Bright Green on our Live In Full Color blog. You’re welcome Jen. I enjoyed looking at your painted furniture and murals. Just loved the floral sideboard. Maybe you can come by and add your magical touch to the one in my dining room. I understand the love-hate relationship with a couch. In my case my son LOVES the leather couch in our TV room and I have come to HATE it. It isn’t that there is really anything wrong with it I’m just really tired of it. He’s a year away from college and I told him when he goes it goes…either with him or on the charity truck. Thanks for stopping by and I look forward to visiting your blog again. Kate – your blog is so fantastic! Thanks for mentioning mine as well. 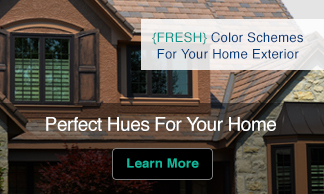 I absolutely love learning more about color for my home. Bookmarking your blog as we speak!! Thanks! Bri, thanks for such kind words. I’m glad you like the blog and look forward to seeing you again soon. I’ll stop back to check in on the beautiful little girl and her mom. Happy blogging! Thanks so much for dropping by my blog and also for reposting the Green Post here. I just went through and visited everyone’s posts and thought it was so much fun! Your blog is really interesting and very informative. I will definately be back. I am such a colour dork!! I can’t see the forest through the trees!! I was wondering if you would consider writing an article on the colour pink. I have a little girl who wants her room to be painted pink (see my latest post on my blog about that). I have found that even the lightest shades end up looking like Pepto Bismal when I put them on the walls. Are there any tricks to this? Are there pink shades that are more fashionable than others?? Thanks for the nice comments Jill. Glad you liked my green pottery and thanks for mentioning my blog! I did a post recently looking for advice on a room in my home. I’d love to hear what you think. Now I have to have more of a look around your site! You are very welcome. I’ll take a look at the post on your room. It will be fun to see what you are up to. I did a double take myself when someone sent me an email saying they saw it. It was originally in the Washington Post (my local paper) and I didn’t know it would be reprinted in other newspapers. This was sure a stroke of good luck for me. Thanks for the nice words about the picture. I was pleasantly surprised since pics in the paper aren’t always the best. I’m actually not developing a line of paints but a range of colors that I recommend that can be purchased through one or two existing paint companies. After having my signature color ‘H2 Ahh!” available as part of Ellen Kennon Full Spectrum paint I was hooked. I’ll keep you posted. Thanks for the mention here as a part of Angela’s green post! As I told her, spectacular food is as good as a spectacular room! This is a womderful place to visit, I’ll be back! Thanks for hopping over and please come again! Tara I so agree and love to prepare a beautiful meal. Thanks for visiting and look forward to seeing you again soon. Thank you for visiting my site and the nice comment on the Green Post. It was fun to read about all the others’ on your blog. I’m glad you stopped by and look forward to having you visit again soon! kate, i recently read a newspaper article that you stated you were all over “faux” is faux painting technique out? also, i have read wallpaper has lost it’s popularity? so do i assume old fashion paint is the new trend? what do you suggest, thanks so much! Thanks for asking some great questions. First I’ll tell you now to worry about what is ‘in’ or ‘out’ so to speak. Always, always, always go with what you like the most and not with something just because it is currently in fashion. A home that reflects the personality and style of you and your family will be a place you love to come home to for years and will feel welcoming to your guests. You are right in my article that appeared in the Washington Post and Chicago Tribune as well as a few other cities did include a quote from my positive review of faux finish from Valspar that said I was “so over faux finishes” that they had pulled from my blog. Here the whole quote from my blog. As you can see my “so over” was more about actually executing the technique not about whether or not it was a great finishi. You can see what else I had to say in Kate’s DIY Project: Valspar Brushed Pearl and get a peak at my powder room. If you like a faux finish then go with it. I did. As for wallpaper it seems that with so many other options– painting, faux finish, stencils, fabric, and on and one –that wallpaper just has more competition. There are some absolutely gorgeous wallpapers out today so I wouldn’t rule it out as an option. I’ll add a post with a few of my favorites as soon as I have time to put it together. Oh, you are so nice to offer to help with my pink room. After re-reading my comment, I am flushing with embarassment because I didn’t mean to imply that I was asking for your help specifically with my room. After re-reading my comment, I realized that I inadvertently did just that!!! What I intended to mean is that I find pink to be a particularly challenging colour to choose because it can be such an overwhelming colour when on the walls etc. etc. etc..
O.K….I am rambling here, so I will stop now and hopefully remove the foot from my mouth!! In the meantime, how gracious of you to offer to help me specifically with finding a non-pepto-bismal pink. I am honoured and grateful. Thank you!!! No need at all to apologize. I answer reader’s questions as often as time permits and I’m happy to answer yours as well. It seems to me that if one person takes the time to ask the question that many more people probably have the same or a similar question. Since it is almost impossible remotely and with limited information to select the one perfect color I have instead chosen to give ideas about how to solve a particular dilemma while sharing some insights into why I’m making the suggestions I am. My hope is that by sharing how I think about color solutions that the readers can learn something that they can take away and use when they tackle their own projects.